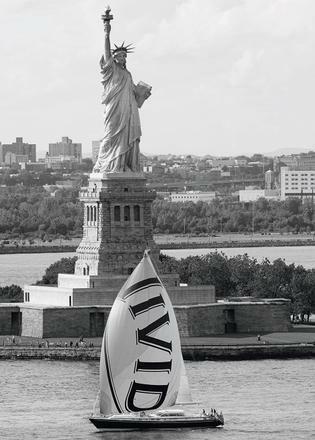 Two circumnavigations and 130,000-plus miles over 12 years… Lenny Recanati has lived sailing life to the full with his 27 metre sailing superyachtVivid. The globetrotting entrepreneur shares the many highlights with Cécile Gauert. “It’s about nature. It’s about the fact that you turn off the engine and just sail with the waves and the wind and nothing else. It is the fact that, by the force of nature, the boat is moving, which is incredible.” Lenny Recanati loves being at the wheel, adrenaline pumping through his veins, forgetting whether it is cold or hot and losing track of time. “Nothing comes close to this,” he says. He likes the intimacy of his boat, the closeness it fosters with family and friends, and reaching out of the way places. 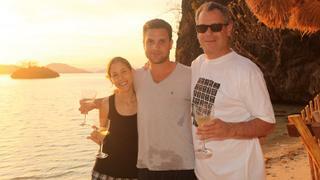 He enjoys being a goodwill ambassador with his boat and crew, who help children in faraway villages. He always takes a camera and captures images of the scenery and animals but also of colourful markets and ceremonies. He’s fascinated with other cultures and doesn’t allow differences in language to get in the way of good conversation, be it in Papua New Guinea, where he met a local chief, or on a tobacco farm in Cuba, where, in 2008, he smoked the best cigar of his life, rolled by the godfather of Cuban cigars, Don Alejandro Robaina himself. He’s done this for more than a decade, on and off, aboard the one and only boat he’s ever owned. He says that, apart from his children, his experiences on board Vivid have been the highlight of the past 12 years of his life. Yet he is thinking of parting ways with the boat, which is listed for sale, a prospect that fills him with mixed emotions. Recanati invested heavily in her upkeep, following a massive refit at Jongert in 2011/12 with another one that included new rigging in the summer of 2016. He’s just flown to New York from his home in Tel Aviv with his wife, Shira, and we’re meeting 35 floors above street level. The view is that of avenues glowing red from the brake lights of cars stretching to a horizon hidden by glass and concrete. There isn’t a mast or a sail in sight. Yet it isn’t such an incongruous location for a meeting to discuss Vivid and the trips they’ve taken around the world. New York is where he was born and he has family here. He returned to earn a master’s degree in business administration from Columbia University, after a boarding school education in the UK and undergraduate studies in economics in Israel, where he grew up and did his military service. He then put his education and experience in various industries to good use and followed in his family’s entrepreneurial footsteps. Two of his three children have joined him to run his private investment company and his wine-making business, one of Israel’s finest. The winery, located in Israel’s Hefer Valley, bears the family name, which hails from the Italian medieval town of Recanati in Marche. He has visited the town in search of his ancestral roots, which go back to the 13th century. He also owns the Israeli professional basketball team Bnei Hertzeliyya and serves on numerous company boards. At 63 he is busy, perhaps busier than ever, but still tries to make time for his hobbies – photography, diving and, of course, sailing. 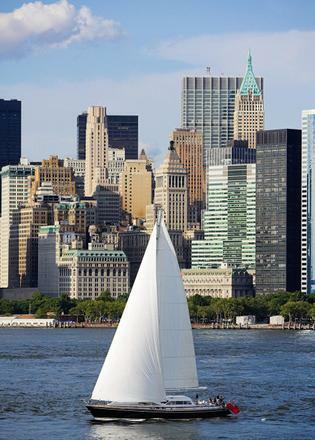 This New York trip is a quick stopover before he reunites, in Belize, with his 27 metre Jongert, although he plans to return soon to talk to wine writers about Recanati Winery’s new vintages. Vivid was built in the Netherlands in 2001 and Recanati bought her from her original owner 12 years ago after a long search. 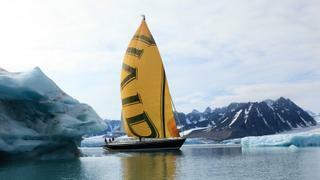 Since then Vivid, with her aluminium hull painted dark blue and brand new rigging, has circumnavigated the globe twice and sailed from the north polar cap to the ice floes of Antarctica. Her captain for 11 years, Timothy Forderer, reckons they’ve sailed 135,000 miles since he came aboard. 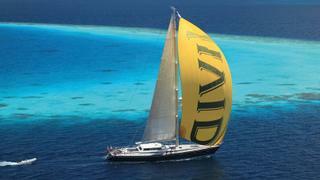 A world map tacked on board charts in various colours the course Vivid has taken over the past decade. The boat has always been known as Vivid. “I was told it is bad luck to change a name and it’s grown on me,” Recanati says. “It’s a wonderful name.” The yacht has been at the heart of unforgettable experiences for the Recanati family and the boat’s crew of four. On display wherever she docks is a YachtAid Global banner, attesting to the relief missions they’ve conducted. The crew delivered school supplies and water filters in places as remote as Komodo, where they also built a fence to protect schoolchildren from the “dragons” that inhabit the Indonesian island. A tortuous path led Forderer to Recanati and Vivid. Introduced by the yacht’s management company, Sea Alliance, after a chance meeting in St Martin in 2006, Forderer flew to meet Recanati in New York. Born in San Diego, he was an accomplished sailor at a young age but had put the sport on a backburner when life called on him to get a steady job. He did well for himself in the mobile phone business but finally recognised, shortly after the sudden death of his father with whom he sailed as a boy, that it wasn’t what he loved and signed up for a captain’s course in Fort Lauderdale. By the time he came highly recommended, he had run a successful charter yacht (a motor yacht) but did not have years of experience under his belt, especially for the kind of worldwide exploration Recanati had in mind. It did not matter. They hit it off. The incident did not dent Recanati’s confidence – or the propeller – and he bid farewell to Vivid as Forderer set sail for Newfoundland, where he would come aboard for a peaceful crossing from St John. It’s something that Forderer, who when he began had only a “six pack” licence and now has a MCA Masters 3000GT unlimited licence, remembers well. Before my New York meeting with Recanati, and before Vivid left for Belize, I met Captain Forderer. We chatted in the boat’s deckhouse over coffee. He told me about a time around six years ago when he shared with Recanati his charity initiatives and the speeches that he gives to encourage youngsters to follow their passion. “I wanted him to know how grateful I was for this experience and, more than that, that I had paid it forward to others around the world.” He remembers the owner listening thoughtfully, smoking a cigar, and replying that his trips on board had been among the best moments of his life. Forderer is the third captain that Vivid has had. 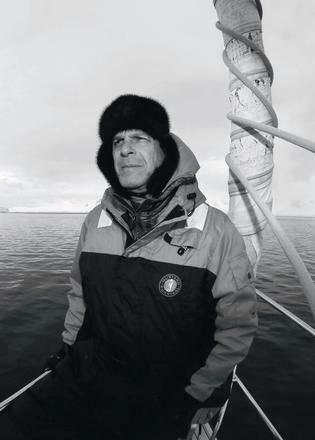 By the time he set sail for Greenland 11 years ago, the boat had already had a brush with a hurricane and made a transatlantic crossing from Tenerife, under a different captain’s command. There was very little wind and Vivid was running on fumes when they finally reached St Barths, the skipper having mistakenly filled only one of the boat’s two diesel tanks. “He kept thinking there was something wrong with the gauge,” Recanati says, “then he realised there was nothing wrong with it.” Recanati, who had a chance to share the experience with one of his sons, nevertheless cherishes the memory. It was also with one of his sons that he took a skipper’s course. The experience rekindled his childhood fondness for sailing. He had loved outings with his father, who occasionally took a break from the shipping business to sail on a friend’s boat. They sailed for hours and then would go into town for lunch, the son trying his hand at spearfishing from the breakwater in the port of Haifa. 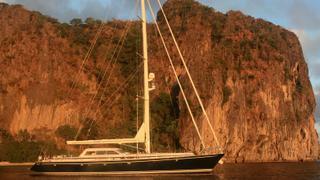 But it wasn’t until that course that the thought of owning a sailing yacht entered Recanati’s mind. He looked at many sailing yachts before Vivid. What he liked about this boat, which was bigger than what he’d wanted at the time, was how solid and well built she seemed. He knows that well as Vivid has sailed from Indonesia and the Marquesas to the iceberg-laden waters around Greenland, the Svalbard archipelago and Antarctica. She’s done more miles than many so-called explorer vessels and without the benefit of special certification for extreme cold. “Vivid is not an ice class boat or a racing boat, but it has everything: it’s a good performance boat and a very safe boat. We have been very careful and we know how to navigate through ice.” He adds that hiring experienced crew is a must and “a bit of luck never hurts”. Luck almost ran out on two occasions, once in Thailand when a malfunctioning thruster and strong winds and currents combined to steer the boat to within a few feet of big rocks, and another time in Drake Passage, which proved true to its reputation as one of the world’s most treacherous bodies of water. 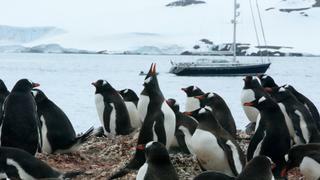 For the Antarctica trip, Forderer had tapped friend and fellow sailor Ashley Perrin, who has since founded Antarctic Ice Pilot. As it happens Perrin was also on board for the trip to Newfoundland and estimates she’s sailed about 1,000 nautical miles with Vivid. Down below at some point, searching for something in his cabin, Recanati was thrown twice and hit the port window. When he put his hand to his forehead, he realised it was covered in blood. “Mr Recanati, I have to stitch you,” he recalls Perrin telling him, to which he replied “Oh no you won’t”. In the end, she treated the wound with biological glue. Even so, that ranks among his favourite trips. “The nature is overwhelming, everything is so big. It’s something I’ll never forget.” Also among his favourites are Raja Ampat, the Marquesas, Papua New Guinea, Komodo and Svalbard. And Recanati has other destinations on his to-do list – the Northwest Passage, the Sea of Cortez and the west coast of Australia among them. He says he’ll take a break after Vivid is sold. His grandchildren are babies, so it’s a good time for his children to take a break from sailing also, and he and his wife want to focus on other projects. But he admits there will probably be another boat someday, something a little bigger for more crew and guest spaces. He knows for sure that it will be a sailboat and look a bit like Vivid. “I love this boat,” he says.